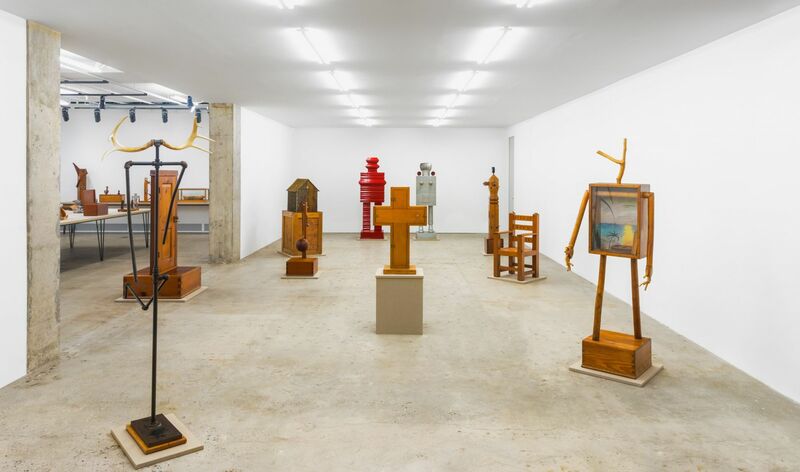 Installation view of "See America First"
A cross-shaped wooden box on a pedestal faced the entrance to this exhibition of H.C. Westermann’s sculptures, prints and drawings at Venus (formerly Venus Over Manhattan). Just beyond, a semicircular arrangement of anthropomorphic wood and metal sculptures further directed the viewer’s gaze to the central cross. This dramatic staging animated the sculptures as part of a communal ritual in which the viewer was obliged to participate: simply walking into the gallery entailed approaching the cross, and viewing the surrounding sculptures required circumambulation of the hallowed object. The configuration echoed the reliquary-like structure of the sculptures themselves, which often enclose cherished items. Titled A Human Condition and dated 1964, the cross box features a front panel attached with hinges placed on a staggered axis, preventing it from being opened. Like Marcel Duchamp’s readymade With Hidden Noise (1916), A Human Condition foregrounds its inaccessible content(s). The interiors of Westermann’s sculptures are often as important as their exteriors. For example, Female Figure (1977), which stood to the right of the cross, has a box-shaped torso with a glass front revealing innards in the form of a painted ocean scene and two weathered books. And Object Under Pressure (1960), positioned behind the cross, is a totemlike post carved from Douglas fir with deep vertical fissures from an unspecified inside force, measured by a pressure gauge that doubles as a head. Westermann’s large constructions are reminiscent of Robert Indiana’s wood assemblages. (Both artists studied at the School of the Art Institute of Chicago in the early 1950s.) Like Indiana, Westermann incorporated text into his columnar sculptures. But he carved the letters into the wood, while Indiana stenciled his in paint. Westermann also meticulously finished his pieces, infusing the humble materials with a sense of preciousness. His craftsmanship and extensive use of inscribed words and images recall trench art, souvenir objects carved by soldiers in their spare time. Though Westermann was influenced by all manner of primitive and folk art, trench art may have had particular resonance, given his service as an anti-aircraft gunner in the navy during World War II and an infantryman in the Korean War. A freestanding door, Little Egypt (1969), was cleverly placed in the doorway to an adjacent gallery, reinforcing the theme of inside/outside while also signaling a shift in scale. This second gallery presented smaller sculptures on a room-spanning table. Westermann had given many of these pieces to particular individuals, including a petite rocking horse inscribed “for baby ed from cliff” (for the son of Ed Ruscha); a log-shaped walnut box enclosing black tape and a pocket watch for William T. Wiley; and a sugar pine box for Billy Al Bengston, inlaid with his signature chevron. The walls nearby displayed Westermann’s illustrated letters to his dealer, Allan Frumkin, a juxtaposition that highlighted the reciprocal function of these sculptural gifts and souvenir-type objects, which were meant to be opened and lovingly handled. The letters document a 1964 cross-country road trip that inspired Westermann’s seminal print series, “See America First” (1968), from which the show drew its title. A unique ink-and-wash drawing related to one of the lithographs in the series was on view, and serves as an apt summary of Westermann’s practice. It portrays a box pierced by a rainbow and spouting a multicolored geyser—a mysterious image in which an object becomes permeable, sending energy outward, as Westermann aimed to do with his interactive sculptures.